I am glad I made it through 2017. I am not ready for 2018. But it’s here, so I better give it my best shot. It’s been one of those years. I’ve heard many more people than usual saying either, “I can’t believe we made it through,” or, “How can it be 2018 already?” But as you say, the new year is here (for you) or almost here (for us), so on we go. I hope it’s a good year for the world. We’ve started with a beautiful day! I’m so glad. And I’m happy that I can send Santa down the road and put up a New Year’s post in a moment. Once I do that, I’ll feel like the new year has arrived. But cold? Oh, my. Even down here it’s going to dip below freezing for several days. Last year, there was no need to bring plants inside. This year it’s a different story. Siamese ibis? With Janus at hand, that’s the impression a quick look conjoins to a suggestive mind. Janus was obvious enough that I added his name to my tags, but I’d not thought of Siamese ibis. The way their bodies overlap, it does look like one body, two heads, and three legs. Appearances can be intriguing. At first I wasn’t sure, either. Then, it became obvious to me which one’s looking forward: the one on the right, who’s clearly already in motion. Its friend seems willing to stand around for just a bit longer; perhaps it’s pondering the pleasures of the past. At first I thought the one on the right but then I wasn’t so sure, so I am glad you have confirmed my first instinct. Honestly, I don’t think — no, I know — there’s no way to know for sure what’s in these birdies’ heads. The truth of the matter is they’re probably both fully in the present, and on the lookout for a frog or a crawfish. Still, it’s fun to imagine them as bearers of a greater truth — or a metaphor for Janus! I couldn’t believe that article. It described a bird nothing like the ones I know: at least, behaviorally. Even when ours appear in residential areas, as they do from time to time, they simply probe around for grasshoppers or crawfish, and then go on their way. One reason they may have developed into a bit of a problem there is that they didn’t make it to New Zealand until 1925. . I’d not thought about movement between Australia and New Zealand, but it clearly has an effect. 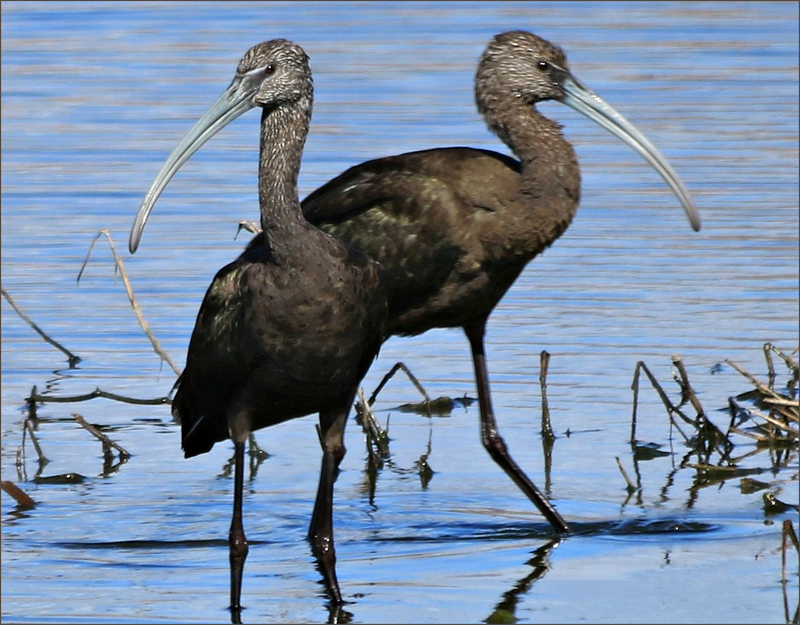 The NZ Birds Online site says that all three species of ibis that inhabit NZ have flown in from Australia. Would that make them invasives? The thought makes me laugh, for some reason. Can’t you just see them over in Australia, plotting tactics and gathering the troops? I also see on the NZ Birds Online link that the White Ibis is a vagrant in NZ. That made me smile, too. As for invasives, the real storm troopers from Australia were the possums .They didn’t come of their own accord of course. Recently however NZ has gotten a little of its own back ( for the country wrecking invasives) in a strange sort of way; we almost brought down the Australian Govt by stealth. Possums are such interesting creatures. I must say, yours are cuter than ours, by far. But they certainly did multiply, didn’t they? Any time an article ends by saying (rather casually, I might add), “But now there are only about thirty million,” there’s a bit of a problem. The same thing is happening here with feral hogs, and those creatures are much more of a pain to get rid of. Feral hogs; even the name sounds unpleasant. I made it through the dual-citizenship business, and could only think, “My goodness.” We went through something similar with a presidential candidate in the last election who was accused of holding both Canadian and U.S. citizenship. Australia’s situation seems more complicated because of changed laws in a variety of counties — I do hope they sort it out! I expect it will be sorted eventually and perhaps constitutionally. Here’s to 2018 being another year with you, Linda!! Happy New Year to you, too, GP. Whatever it brings, a smile or two will help us cope! Very striking shot. Those beaks could be black steel, and serve for Father Time’s scythe. Your column has been a bright spot throughout 2017, and looking forward to what you think up for 2018. Best wishes for the new year! That scythe image is great. Thanks to that, I suddenly saw their beaks as swords, and began wondering whether they use their beaks to fight one another. Apparently they don’t, since I couldn’t find a single reference to such bad behavior. It’s been a fun year, hasn’t it? Your wacky sense of humor suits me just fine, and I really enjoy your view of a part of the country I’ve never seen. Here’s to more fantabulism in 2018! I’m with Robert~your posts are among the things that keep me going, give me a welcome diversion from dreadful news. Here’s to a Happy(er) New Year! Well, gloom and doom can be cheap and easy, Melissa. There are more than enough social media and other sites willing to serve up woe, wretchedness, misery, and conflict — even where it doesn’t exist. Better we should paint, write, roam about in nature, and then share what we find. When the occasion arises, we can get involved with specific causes that are important to us, but there’s no use obsessing over things we dislike but can’t change: North Korean leadership and the President’s tweets come to mind. I’m looking forward to the New Year, and hope you are, too. I hope it’s filled with beauty and inspiration for you. Thank you, and the same for you. Nature never lets us down, does she? Not in my experience, Melissa. Every season has its delights as well as its challenges, and I love them all. No frostweed for me. On the other hand, I did get to experience sleet, snow, and icicles — real icicles! Dare I say it was pretty (and) cool? I always look forward to seeing your photos and reading your posts. Thanks for the grins and for your lovely prose. Wishing you a good 2018–and thanks! It’s been fun getting to know you, your garden, and your bees over the past year, Tina. All things considered, our cold snap couldn’t have come at a better time. I’m looking forward to getting a few things organized (including my photos) and getting ready for another year of “Show and Tell.” I loved it as a kid, and I’m loving it now — I’m so glad you’ve found something here to enjoy. Happy New Year! I couldn’t agree more with your inside use of the current cold, though for myself, the masses of leaves on the ground beckon…. I’ve thoroughly enjoyed your insights and your writing–thank you for demonstrating thoughtful prose, without pretense. It’s a rare gift! It’s only January 1, and you’ve already made my year, Tina. “Thoughtful prose, without pretense” is exactly what I’ve wanted to learn to provide. Impenetrable prose makes it in academia and other arenas, but it’s off-putting to those outside the circle — and I don’t want anyone here to feel like an outsider. Oh, if only I’d been able to find a couple of hoglets peering about! But all we have are feral hogs, and they’re not particularly cute. So, the birds will have to do — and they did do rather well, didn’t they? It’s going to be fun watching your outdoor space develop over the spring and summer, Dina. I had just a peek at your new post, and saw that you’ve already received some additions to put to creative use. Enjoy your planning, and best wishes for 2018. A perfect image for this day! Happy New Year! And a Happy New Year to you and Rick, Jeanie. Whatever the year brings, I suspect it won’t be quite so fraught as 2017. Enjoy every minute! HaHa, fun photo! Looks like a two-headed ibis! It’s nice to spend part of today looking back and part looking forward. Here’s hoping you have a wonderful 2018, Linda! So nice to see you, Debbie. I trust your family time at Christmas was great, and that you’re ready to move into this new year–at least, in a day or so. I’m busy being more sympathetic to you than I might have been in the past. I know cold is a pain, but we’re getting some real cold, and I’m remembering why I’ve committed to staying in the south. Tomorow is going to be an inside day, for sure. I’ve planned to start reading your novel. I think it will go quite nicely with a cup of tea — or two, or three. Happy New Year! Thank you in advance, Linda, for tackling it. I’m told the end justifies the somewhat draggy start! Hope you can find some enjoyment from it. Domer has gone back to the Windy City, so it’s time for me to shake a leg and get some work done. Thank goodness my work is the inside kind! I saw where even Texas is getting some of this brutal cold, so try to stay warm! Happy 2018! Congrats on a new venture! Interesting visuals here. Allow me to wish u all the best in 2018! May the New Year bring in wonderful new opportunities and exciting turning points! This really has been a fun project, Arti. I’ve enjoyed sharing some of my photos, and it’s been a good way to encourage myself to keep improving. I have a long way to go, but at least I can see the road. I think this is going to be a good, productive year. We’ll see! Aren’t they a beautiful pair? Each of them is showing just a tinge of iridescence on their wings. When they’re in full breeding plummage, they really are magnificent: almost jewel-like. A happy new year to you, Terry. I’m hoping there’s a hike in your future, even if it’s just down your road. I tried to post from my tablet yesterday and couldn’t find the post comment button after I typed my comment in. Thanks, Gary. There’s always something to see at the refuge, and I smiled and smiled when I found this little pair. Here’s one more wish for a happy New Year — may we always find our comment buttons, and not press them when they shouldn’t be pressed! Here’s hoping the New Year brings us all a little more peace and a little less conflict around the world. I really enjoy finding and photographing the younger birds. I’m glad you enjoyed this pair, and I’m glad I finally figured out how to identify them. And a great New Year to you! With many opportunities to photograph and write about the beauty all around us…. I wish the same for you, Lynn. I still have a list of places to visit from last year, and even the year before. We certainly don’t lack for opportunities! Happy New Year! We spent the New Year’s Eve in the Hill Country outside of Llano freezing our petunias off — although the temps were higher than they were up here in the flat lands where it got down into single digits and was officially colder than the proverbial wedge. Our friends took us into Fredericksburg and we stopped at the Wildseed place where I got a big packet of hummer-friendly wild flowers. Come March, I’ll have the yard guy muck out that front bed and sow me a small, triangular prairie out front. (Including the ones I received from you!) We spent the New Year with a Dixie — alas, she was a dog, and not the darling Miss Dixie chez vous. What a wonderful way to welcome the New Year. That’s one of my favorite parts of Texas — once life here is a little more under control and the weather has improved a bit, I’m planning a return trip. I’m glad you got to Wildseed Farms. It’s not only beautiful, their staff is the most helpful and friendly I’ve found anywhere. They’re even patient and friendly over the phone. It’s not been exactly toasty here, as I’m sure you know. On the other hand, if everything else goes well, the chill hours will be good for the peaches and bad for the mosquitos. That’s a winning combination in my book. It’s been hard to get back into a routine, given the weather, but the sun is out now and a warming trend starts tomorrow. We may get to the upper 40s tomorrow, and the upper 50s on the weekend. That’s perfect getting out and about weather. Happy New Year! Great title for this post, and these are really nice. I mostly see the White Ibis here in FL. We have three species: the white, the glossy, and the white-faced (which often are confused with the glossy). They’re all fun to watch, and the juveniles of all three species are interesting. When I’ve seen them in recent months, they’ve appeared to be more social, but that may be a lack in my observational skills rather than a change in their behavior. Golly that is an exceptional shot of the ibis that perfectly illustrates your topic of this post. Personally I am looking forward to a better year but that remains uncertain. But I always look back, Just can not help myself since I tend to ruminate on every little thing. I think we all look in both directions at this time of year, Yvonne. I certainly do. For myself, an occasional glance backward is enough: sometimes with a smile, sometimes not. Still, none of us starts a new year with a blank slate, and it’s worth remembering that, too. I was a little disappointed with the first photo of this pair, since a couple of the legs were in motion and quite blurry. Then I saw this image, taken only seconds later, and was delighted to find that one had turned its gaze, leaving them to look in opposite directions. It certainly did make it the perfect photo for the New Year.